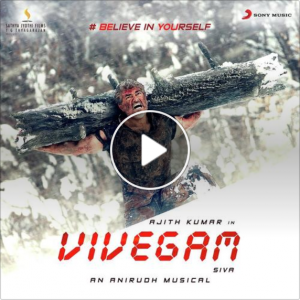 Vivegam (Music review), Tamil – Anirudh by Milliblog! Surviva is a relentless affair. The music is pulsating and Yogi B leads the frenetic vocals in style. Thalai viduthalai goes one step ahead, with punchy vocals delivered with panache by Anirudh and Harish Swaminathan. Veriyera, though, goes overboard and is rather generic. Even Kadhalaada‘s beautifully flowing (Kedaram? Nalinakanti?) melody—deftly handled by Shashaa Tirupati and Pradeep Kumar—is relatively faster, with racy interludes featuring brilliant violin. Its reprise—thankfully—slows down a bit! In Never Give Up, Raja Kumari aces Anirudh’s catchy R&B mix with a psychedelic music-scape, while the Ready to Rage theme is aptly background’ish. Energetic soundtrack with an international appeal!